It led to an email discussion with a YTC newsletter reader who accepts the value of motivation to a trader, but couldn't see the relevance of the Bruce Lee quote in the middle. The quote commences at 1:37, if you wish to skip forward in the video to listen to it. This is awesome. For me, this was the best part of the video. Yes, the sections before and after were incredibly motivating. But the section by Bruce Lee is so much more. Perhaps this was the reader's problem. He was simply examining this quote for it's motivational lesson. For me though, this quote reveals the real essence of what it means to be a successful trader. Most traders are too rigid in their mindset. They hold a bias and refuse to bend or change despite all evidence to the contrary. Most traders are too rigid in their trading tactics. They fail to change to suit changing market conditions. This is why I'm so against the idea of fixed-rule systems… at least in the way most retail traders use them. There is no flexibility. There is no way to adapt. The market is an uncertain and ever-changing beast. It changes in directionality, in volatility, in liquidity. It changes in the way price moves… smooth flowing or choppy with much overlap. Fixed rules cannot capture these changes. Rigidity in thought process and tactics will simply lead to frustration, financial loss and psychological stress as we try to force OUR PLAN onto a market that cares little for our needs. What we need are not fixed rules, but rather rules-of-thumb. What we need are not fixed parameters, but rather experience in real-time interpretation. What we need is not discipline, but rather adaptability. Just as water adapts without any fight to fit whatever container is provided, we as traders must be like water and adapt without struggle to suit the ever-changing market conditions. Be open to the idea of change and allow yourself to accept the information the market provides. You can't control the market. But you can learn to flow with it. Flow with the market and adapt to the environment it provides. 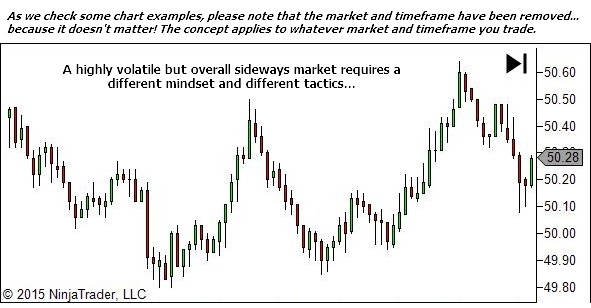 Your task… if your trading plan does not allow for flexibility and adaptation to differing market conditions… why not? And what can you do to fix this oversight? Thanks David! Yes, it helps sometimes when I get frustrated with some of the other traders just to remind myself that we do need someone on the other side of our trade. That usually puts their behaviour into perspective and makes it all ok again! 🙂 Glad you enjoyed the article. Thanks. Incredible I actually put that Bruce Lee philosophy on my twitter feed in relationship to trading in January . It is so relevant in exactly the way you mention . Like the way you think Lance , will read your whole blog now . I am so happy in my trading career that I came to know about you and this website, Lance. I was a ‘breakeven’ trader for last 2 years. And now, I have started making little money in the markets following ytc strategies. I am yet to become consistently profitable trader. But NOW I know the path I need to follow. I will remain forever indebted to you. Thanks for your kind words. I’m pleased that I have been able to help. It’s a process of growth and development. There are no shortcuts. Every stage requires a different “you”. Congratulations on your recent breakthroughs. And best of luck for the next stage of your journey – gaining consistency and therefore further improvements in results.